In her striking second collection, Natalie Scenters-Zapico sets her unflinching gaze once again on the borders of things. Lima:: Lim n illuminates both the sweet and the sour of the immigrant experience, of life as a woman in the U.S. and Mexico, and of the politics of the present day. Drawing inspiration from the music of her childhood, her lyrical poems focus on the often-tested resilience of women. Scenters-Zapico writes heartbreakingly about domestic violence and its toxic duality of macho versus hembra, of masculinity versus femininity, and throws into harsh relief the all-too-normalized pain that women endure. Her sharp verse and intense anecdotes brand her poems into the reader; images like the Virgin Mary crying glass tears and a border fence that leaves never-healing scars intertwine as she stares down femicide and gang violence alike. Unflinching, Scenters-Zapico highlights the hardships and stigma immigrants face on both sides of the border, her desire to create change shining through in every line. Lima:: Lim n is grounding and urgent, a collection that speaks out against violence and works toward healing. 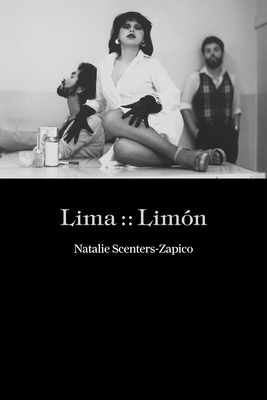 Natalie Scenters-Zapico is the author of The Verging Cities, as well as the recipient of the PEN American/Joyce Osterweil Award for Poetry and the National Association of Chicano/a Studies Book Award.